The walnut (Juglans regia) is the oldest cultivated fruit in the world and is believed to have originated in Persia but is now grown throughout the world. This wrinkled nut has the same shape and appearance as the human brain and is considered by many to be the ultimate brain food, a superfood and the healthiest nut around. Packed full of nutrients, walnuts are rich in a flavoursome oil which is equally healthy. Artists have used walnut oil in their oil paintings since the 5th century and it was one of the most important drying oils during the Renaissance, frequently used by Leonard da Vinci. Walnut Oil is roughly half linoleic acid (Omega-6) a good percentage of oleic acid and up to 15% linolenic acid (Omega-3) which represents the highest percentage of Omega-3 fatty acids of any oil. There are also smaller amounts of myristic, palmitic, palmitoleic and stearic acids present, plus tocopherols, phospholipids, sphingolipids, sterols, hydrocarbons and 29 volatile compounds such as terpenes, alcohols and carbonyls. The predominant sterol is b-sitosterol which makes up over 80% of the total sterols with ∆5-avenasterol, campesterol and cholesterol being present in much lower percentages. Walnut Oil is pale yellow to yellow in colour with a pleasant nutty aroma. 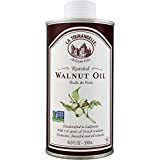 Walnut Oil is cardioprotective and regular consumption of this oil wards off not only heart disease but diabetes and high blood pressure, even during stress. Walnut Oil preserves the function of the endothelial cells which line blood vessel walls, helping them to work better, thereby contributing to cardiovascular health. It also assists the transportation of HDL (the good kind of cholesterol) and the removal of excess cholesterol from the blood stream and body. Walnut Oil is good for the bones, for the digestive system and for preventing cancer. It has anti-inflammatory properties which make it a valuable addition to the modern diet. Walnut Oil is rich in antioxidants and has good moisturizing, anti-aging and regenerative properties. It is soothing, softening and emollient, as well as antimicrobial, toning and astringent for skin. The fatty acids in Walnut Oil form a protective barrier on the surface that help prevent water loss. Walnut Oil is a wonderful ingredient in massage, aromatherapy and cosmetics. It can be included in preparations for dry skin, anti-wrinkle creams, anti-aging products and even in serums for the delicate area around the eyes. It is useful for skin diseases like eczema, warts, psoriasis and fungal infections and for scalp and hair problems. Walnut Oil is best used cold for culinary purposes as it is delicate and not very heat stable and has a bitter taste when heated. It is expensive so more of a condiment to add to meat dishes and the like towards the end of cooking or to add flavour to desserts. It has a distinctive and delicious nutty taste which enhances salads, salad dressings, sauces and vegetables. It mixes particularly well with balsamic vinegar. Walnut Oil is good drizzled over fish and pasta. In a bowl, mix the sugar and eggs with a whisk. Add the sifted flour, ground almonds, baking powder, oils and nuts. Mix well. Spoon the mixture into the madeleine pans. Let stand for 10 minutes. Turn out and enjoy warm. Optional: sprinkle with chopped walnuts and / or almonds before baking.